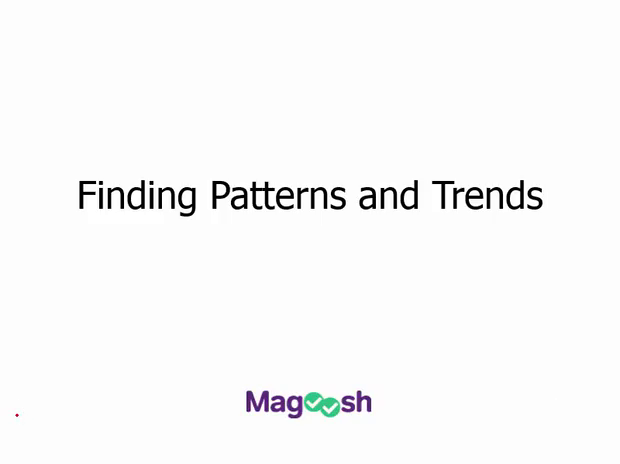 This Magoosh ACT Science lesson is about something that is extremely crucial to your success on the science test and that is finding the patterns, and trends in the data that is presented to you. So let's start by generally talking about the patterns and trends, the ACT will ask you to identify on the test. Now, this lesson is incredibly important. Because approximately, 50% of the questions on the science test are going to ask you interpret the data, the patterns and the trends in some way. So, this may be one of the most important lessons we actually have at Magoosh for ACT science. So, pay attention carefully. Now if you haven't yet watched the lesson that comes before this, understanding graphs, tables and figures, I suggest you watch that one first, particularly if you're a little shaky on how to interpret scientific graphs. I'd also suggest that you take a look in the ACT science tests first just so you can orient yourselves to what these setups on the test look like. If you've already done that, you're good to go. Let's go ahead and jump in. Now I'm using a color graph here to make things a little bit easier to see for the purpose of this lesson. But I think it's a good reminder to remember that on the ACT, all the charts and graphs and figures will all be in black and white. And sometimes on graphs, that can make things a little bit harder to read, particularly if it's in gray scale. You always want to make sure that you're looking at that right shade of gray. Be very careful that you're looking at the right line. I see so many students make mistakes that they didn't intend to make by looking at the wrong line. So, just something that's worth keeping in mind and I'll probably repeat it a few times throughout our lessons here. So, let's go ahead and take a look at an example here. The ACT will often ask you to interpret the meaning of a table or graph based on changes in the data. So, the example graph on your screen shows a collection of four water tanks that are being measured every couple of minutes to determine the amount of water that they hold. So the amount of water is being tracked along the vertical axis and that is dependent on the rate at which the tanks are being filled, emptied or kept constant. We have time along the horizontal access here. So if we have this question, which tanks are being filled with water? Well, let's take a look at tank one. So as time goes on, the water level in tank one is increasing. So, we could infer that is being filled. For tank two, however, as time goes on, the water level is decreasing. So, that would mean it's being emptied in this experiment. Tank three, it's increasing as time goes on. So, we could infer to that as being filled. And tank four, the water level is not changing as time goes on. So, we can infer that it's being held constant. So for this question, this easy example. We would choose d, tank one and three are being filled with water. Other times, the ACT is gonna ask you to predict points beyond existing data points. This is called extrapolating. So, let's take a look at this example. At ten minutes, the students could predict that tank three will contain how much water. So here's tank three, it's our orange line here. We wanna take a look at the pattern here. So, this is a constant line. So, we wanna extend that line out to where ten minutes would be and see where we would be at on the vertical axis. So, it looks like we're at about 50 liters. So our answer would be b here and notice that the answer choices here, around 50 are pretty far apart. 40 is down here. 60 is up here. So, the ACT is not gonna be unfair. It's not gonna give you answer choices like 49, 50 and 51. They'll be sufficiently far apart that you can estimate where that line should be. So sometimes, you're gonna get the same type of question with a chart instead of a graph. So in this case, we're gonna look for the column for tank three and see if we can see what is happening between these points. So we can see that between zero and ten minutes, it's increasing by, I'm sorry, between zero and two minutes and it's increasing by ten liters. Between two and four minutes, increasing by ten liters. So, it's increasing by ten liters each time. So we could then add 10 to the last value and predict that after the next 2-minute interval, we would be at 50 liters. Now, something to be careful about here is tank three. On the graph, we saw that, that was a straight line. But tank one was a curved line. So the relationship between the data here is not always gonna be linear, so we need to make sure we actually find the pattern that's occurring here. So, let's look at tank one. So between minute zero and two, it increases by two litters. But between minutes 2 and 4, it increases by four and then 8 and then 16. So each time, it's doubling here. So, we'd wanna double 32 to predict where that's gonna be at 10 minutes and get 64. So be careful you do find a pattern, especially on tables. Because it's gonna be harder to spot then on a graph where you can just extend the line out. Other times, the ACT is gonna ask you not to extend the line out not to extrapolate the data, but to do what's called interpolating which means finding a data point between existing data points that they're giving you. So if we have this question at five minutes, does tank one contained approximately how much water? Let's look at tank one. It the red line here. So, we'd be about here. Now notice there's no little dot there to tell us what that value is, but we can just trace it up from the horizontal access and then predict where it would be on the vertical access which looks like about 12 liters. Now, let's go ahead and talk about something that you've probably talked about in your math class. Maybe don't wanna talk about for the ACT science test, but it is going to show up here as well as too and that's direct inverse variation. So a quick little review. Direct inverse variation means that as X increases, Y increases. And inverse variation is as X increases, Y decreases. Now the ACT science says, it's gonna rarely use these terms. Although it might and this concept is gonna come out in the ACT math test, so they are worth knowing. But the way that this is gonna be tested on the ACT is you'll see questions that ask you to determine what happens as one value increases, what happens to a second value or to a second set of numbers. So, here is a bit more of a challenging test like question for you to take a look at. If you wanna go ahead and pause the video now, and see if you could solve the problem, and we will come right back. If you took a stab at it, let's see if you are correct. If you wanna walk through it together, let's go ahead and do that. Which of the following best describes the relationship between current, voltage and resistance? So this current increase with the increase in voltage. Increase with the increase of voltage, but decrease with the increase of resistance where it just all these increases and decreases terms. So we need to figure out what's happening with between current and the values for voltage, and resistance. So, we kinda get a big picture of our chart here. So, we can see that there are some sets of trials here and resistance is being held at a certain level for each one. So I'm actually gonna segment this out, because if you notice there's not kind of a trend between them. These are different trials and we're mixing up values for voltage here. So, it's gonna help to look at these in smaller sections. This is something that will also have been defined by the experiment on the ACT. So I'm just pulling out a little bit of data, because it's hard to show everything on your screen. But that would help to kind of get that set up from the actual experiment. So as current increases within this set of trials one through three, we can see that voltage is increasing. As it increases in the next trial, we can see that it's increasing here. Voltage is increasing and as current increases here, voltage is also increasing. So we could say, as a current increases, voltage increases. So that means that we could eliminate c and d and we need to see what's happening with resistance, but it's a little hard to tell. Because it looks like resistance is being held constant, if you're just looking internally within the trials. But that's not one of our answer choices, so we need to figure out what's going on here. So we have some different values here and we can see what's happening with these individual values, and whether resistance is increasing or decreasing. So when its current is 0.667, we see that resistance is 9. So, what's happening at a higher value? Let's look at four. At four, it's three and let's pick something in the middle. So when it's two, it's six. Let's plug that in there. At two it's six. So it looks like as current is increasing, resistance is decreasing. It goes the opposite direction. And so, that means that our answer is going to be b. Let's take a look at one more way that this plays out on the ACT science test, the idea of finding a pattern and these are the types of questions I asked you to create your own graph or table. But it's a multiple choice test, so you don't actually have to draw it. You're gonna have to choose which graph you would create from a set of four options. So we have this question, which of the following graphs most accurately reflects data shown in Table 1 for PM2.5? Let me go ahead and show you the tables for this problem. We have table 1 in here and we're looking for PM 2.5. I'm gonna go ahead and pull all that information together, the relevant information with this problem on one screen, so you can see it. So, we're asked for which of the following graphs most accurately reflects the information shown in the table. So PM 2.5, we are looking at, we can see we have region A and region B here. We have PM 2.5 along our Y-axis. So, that's all held constant. So, let's take a look at what is happening with the data here. Now, notice these look pretty different. And so, one of the ways that is really helpful to approach these types of problems is to look or work by a process of elimination. So, let's take a look at region A here. It looks like there's not a ton of variation in the values. It's like 4s with a couple 3s. So, we're not gonna have wide swings in data for region A. So, I think we could eliminate C and I'm gonna eliminate D too. Because if we look at the months, it's not going three, four, three, four, three, four quite like that. So, we're gonna have a relatively constant level for region A. And now we need to determine what's happening with region B. And so, we wanna just kinda find a few plot points that will help use identify what's happening here. So we see that it looks like in B that there is a low point between May and September, does that appear to be correct? It does, it appears like the values are lower here and they are earlier in the year or later in the year. So that also gonna works with A, so we need to see whether there's some constant values here between January and maybe April or maybe like October and December. That's what's different between these graphs, so that would be one way to take a look at it. So these values are not the same between January and April, and they are not the same between October, and December. So we can eliminate B and then let's go ahead, and just double check, and make sure things seem relatively correct for region B. So if we look at January, it's supposed to be 25. Now remember region A is fours and threes, so it makes sense that the whole thing is lower than region B. And so that also make sense to me whereas this one, the fours and threes lines region would be cutting into the graph and that actually wouldn't make sense with these values. So, our answer for this one is A. One more thing I do want to mention is that sometimes, there is no pattern in the data. So, here's a chart where there actually really is no pattern and what's happening to this tank as time goes on. So, the data is a little erratic. So, not all information is going to follow a pattern of increasing or decreasing. Sometimes, there is no pattern. So don't be afraid, if that happens to you and you really can't see what the pattern is. If a question gives you the answer choice, such as neither increases or decreases or it cannot be determined, look carefully. It could definitely be true that there actually is no pattern. Quick recap. I know this has been quite a lot in this lesson. When reviewing tables and graphs, note whether a value is increasing or decreasing as a corresponding value increases or decreases. Remember, sometimes there just might not be a pattern and that's okay if there's an answer choice. It doesn't mean that there's no pattern, but think twice before you try to create a pattern where there isn't one. And if you have to create your own graph, meaning choose the graph that fits from your multiple choice answers, work by a process of elimination with your answer choices.